At the beginning of August, I shared a page from Kidding Around, the art journaling class Trevor and I were taking together. The page was titled, "10 Cool Things About Me." (Click here to see it.) I can't tell you how many people asked me about two items in particular: the time I found a baby and the time I was interviewed on MTV by Pauly Shore. Time to finally tell the stories! As it turns out, I'd included those stories and a few others in a mini book I made in 2011 for a National Scrapbook Day challenge. This story is about starring in an instructional video. "Not too many people can say they've starred in an instructional video, but I have! I had done a lot of work with the Lawrence Hall of Science before, testing new kits and having my class photographed for one of their books. When they approached me to star in an instructional video, I jumped at the chance. It was really cool- a wireless mic taped to me, stage directions to follow, and a director telling me to say a certain line. Too bad I woke up with a 102 degree fever the first day of filming! I wasn't going to miss the opportunity, so I came to work really sick and managed to make it through. I'm glad I did." The next story is about meeting Pauly Shore. 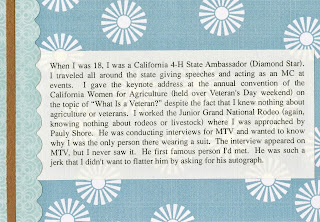 "When I was 18, I was a California 4-H State Ambassador (Diamond Star). I traveled all around the state giving speeches and acting as an MC at events. I gave the keynote address at the annual convention of the California Women for Agriculture (held over Veteran's Day weekend) on the topic of “What Is a Veteran?” despite the fact that I knew nothing about agriculture or veterans. I worked the Junior Grand National Rodeo (again, knowing nothing about rodeos or livestock) where I was approached by Pauly Shore. He was conducting interviews for MTV and wanted to know why I was the only person there wearing a suit. The interview appeared on MTV, but I never saw it. He's the first famous person I'd met. He was such a jerk that I didn't want to flatter him by asking for his autograph." Here's the story about finding the missing baby. 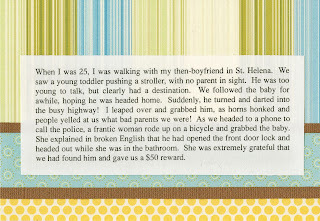 "When I was 25, I was walking with my then-boyfriend in St. Helena. We saw a young toddler pushing a stroller, with no parent in sight. He was too young to talk, but clearly had a destination. We followed the baby for awhile, hoping he was headed home. Suddenly, he turned and darted into the busy highway! I leaped over and grabbed him, as horns honked and people yelled at us what bad parents we were! As we headed to a phone to call the police, a frantic woman rode up on a bicycle and grabbed the baby. She explained in broken English that he had opened the front door lock and headed out while she was in the bathroom. She was extremely grateful that we had found him and gave us a $50 reward." Here's a story about my medical abnormality. "My heart is rotated 90 degrees from normal. 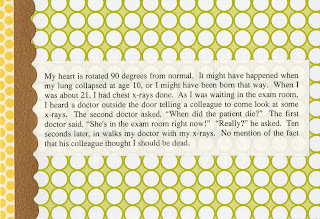 It might have happened when my lung collapsed at age 10, or I might have been born that way. When I was about 21, I had chest x-rays done. As I was waiting in the exam room, I heard a doctor outside the door telling a colleague to come look at some x-rays. The second doctor asked, 'When did the patient die?' The first doctor said, 'She's in the exam room right now!' 'Really?' he asked. Ten seconds later, in walks my doctor with my x-rays. No mention of the fact that his colleague thought I should be dead." My maiden name caused a few problems. "I was temporarily switched at birth. Fortunately, my mom took one look at the baby they brought her and said, 'This isn't my baby!' After cleaning me off, they'd brought me to another woman with a similar last name- Jonas instead of Jones. This was only the first of many times my last name caused me problems. In college, I got a phone call from the police department, saying they'd found my driver's license. I had mine right in front of me, but they insisted- 'Cynthia M. Jones, right?' Yes, but not me. Same thing happened with a very pushy bill collector. 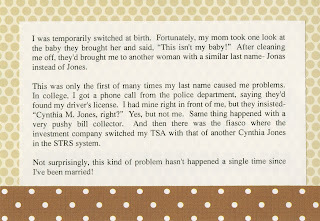 And then there was the fiasco where the investment company switched my TSA with that of another Cynthia Jones in the STRS system. Not surprisingly, this kind of problem hasn't happened a single time since I've been married!" 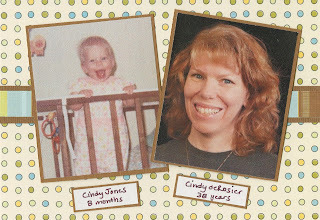 While I haven't had a case of mistaken identity as Cindy deRosier, I have a new set of problems! 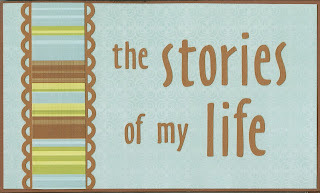 When I made this album, I left a bunch of blank pages so that I could add more stories. I really should do that. I have enough stories like this to fill dozens more pages. When I posted the link to the 10 Cool Things About Me post on Facebook, one of my friends commented "You're cooler than you let on!" which cracked me up. 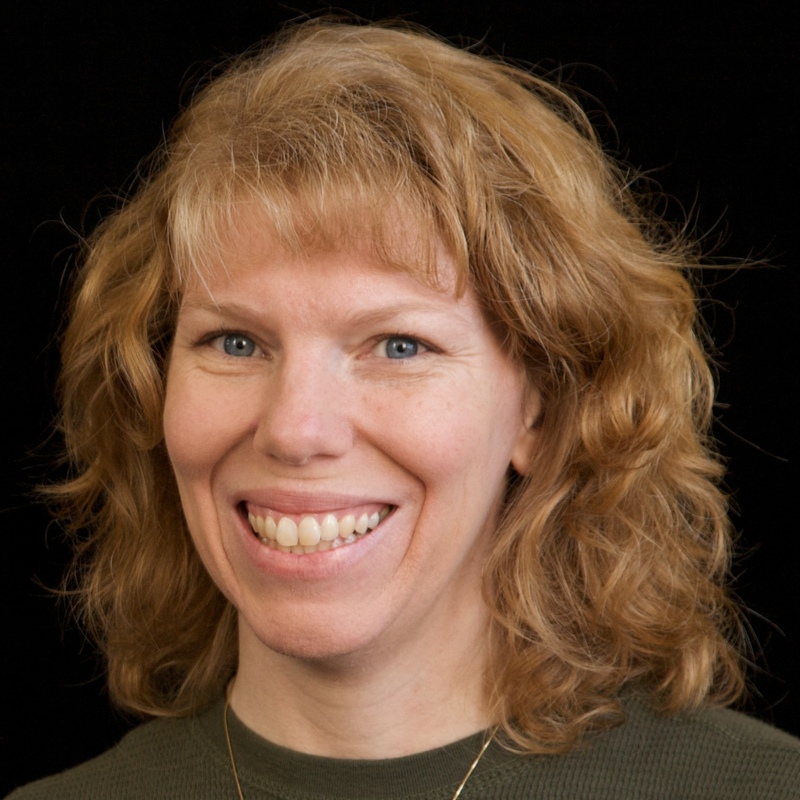 I've decided that if I ever write an autobiography, the title will be "Cindy deRosier: I'm Cooler Than I Seem." How fun has this been to read!?!?!?! I love the baby rescue story ... thank goodness you were both there!!! There is another Julie Tucker in my state (county even) that has CAUSED me all sorts of problems ... she is a realtor gone bad ... and I have been served by the state real estate board, gotten checks in her name, bill collectors ... it's bad ... so thank goodness I am literally the ONLY Julie Tucker-Wolek in the universe!! LOL!!!! "Julie Tucker: Realtor Gone Bad"... sounds like a trashy TV movie! Brian Wolek saves the day again, rescuing you from Common Name Hell. very cool!! Loved both stories!! I love all the stories but I really chuckled about your last name problem... See I have the same problem w/ my first name: Doreen. You wouldn't think it would be that hard to pronounce or spell but people apparently have a hard time w/ it. I actually started telling people, like at Starbucks or Farmer Boys where they ask for your name when you order, that my name is Madison. Madison is my daughter's name and nobody ever spells it or pronounces it wrong. For the times I forget and give them my real name, I keep the receipts of the mispelled versions in preparation for a future layout about the subject. I don't have enough to make a page just yet but soon. Doreen doesn't seem that hard at all! I'd expect the occasional Dorene maybe, but I can't imagine why it would be hard for people. Oh my gosh - that is funny! Nope, not in the US. We're still holding out hope. Eventually, we'll break down and watch it online if we have to.